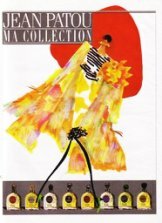 Patou’s Ma Collection consists of twelve fragrances originally launched between 1925 and 1964, then re-released in 1984. Each of the perfumes in Ma Collection has a story. For instance, Adieu Sagesse, intended for redheads, first came out in 1925 and translates into scent the idea of throwing caution to the wind in love. Henri Alméras, the nose behind Adieu Sagesse, went on to create Joy. Vacances commemorates the French law granting paid vacation, and L’Heure Attendue celebrates V-Day in Europe. Tracy, my favorite sales person at the Perfume House, took down the bottle of Adieu Sagesse and dabbed its contents on a cotton ball. The tester was old, and it took a few minutes before the scent really began to bloom. It was spicy and floral — maybe carnations? — and the dry down was velvety clove and civet. I asked about another of the Patous, and before long the counter was strewn with cotton balls dampened with golden splotches of Eau de Toilette. I was bowled over by Cocktail, a green chypre with a quickly-vaporizing top note of lavender that feels like the first sip of martini, sharp and intoxicating. As it settles, it leaves only the barest tingle of dry, powdery flowers close to your skin. I also loved Normandie, which smells to me like a cedar chest with an armagnac-soaked prune in it. Que Sais-Je, a honeyed chypre that Luca Turin recommends for women who don’t like the vanilla in Shalimar, is difficult but beautiful, and reminds me more of Rochas’ Femme than a Guerlain. Wearing most of these Patous is like pinning on an old rhinestone brooch or carrying an alligator clutch from the 1930s. They don’t smell like anything made today. The Ma Collection fragrances are now discontinued, but you can find some of them online, or, if you’re lucky, in a perfume shop with a lot of stock. The Eau de Toilette comes in a 75 ml splash or 50 ml spray bottle. The Parfum is a full 30 ml, in a bottle wrapped in a silk scarf. All twelve of the fragrances are also sold together as Eaux de Toilette minis. More reading: a brief history of Jean Patou (in French, be sure to click on "Suite" to see the whole article). Luca Turin’s now defunct blog, Perfume Notes, has a great description of Jean Patou’s operations today; you can download a .pdf of Perfume Notes at Flexitral. Thank you very much for your lovely review. I was lucky to get my hands on a Ma Collection set. All 12 are gorgeous. So far Adieu Sagesse and Que Sais-Je are my favorites. Lovely review! I frequent The Perfume House quite often, too. It's like mecca!! I like both of those, too. I like spraying some behind my kness and saying, “Adieu Sagesse!” before I go on to my more practical day. The Adieu Sagesse reminds me a lot of Divine Folie, except that I smell more vanilla and amber in the DF drydown. They sounds so interesting, and you've certainly done them justice in your review. Thanks, Angela! What a glorious review! A dear friend was able to buy the entire collection on eBay a couple of years ago for a song. What a divine find! I had a decant of Vacances that I wore for quite awhile until I accidently dropped and broke it. :(:( It is by far the best lilac fragrance that I have ever smelled. It is not “air-freshner” lilac at all, just pure, beautiful, fragrant lilac as I had hoped it would always be in a perfume. Vacances is wonderful, it's true. I like it for when I don't want to smell too complicated–just fresh and summery. I wish it would stick around on my skin a little longer, though. Yep — another collection I have never tried! But I am lemming it now… so much sniffage, so little time. I think these are worth a sniff, if for no other reason than that they smell so different and behave so strangely compared to so many modern perfumes. Cocktail is an example–a quick, sharp BOOM of top notes, then a quiet scent follows. Colony was my favorite of the line, too. I didn't realize all 12 perfumes are discontinued now. It's kind of a shame considering the history behind them (love those names, too). To me, it never smelled sharp (I usually like sharp top notes–I need that zing) but like a round, smooth pineapple chypre. Great review, R.
I think you're thinking of my comments on Cocktail, rather than Colony (which is in tomorrow's article, actually). I agree with you that Colony is round and thick rather than sharp at the get-go, like Cocktail is. Colony is gorgeously strange, too. Do you know what any of the notes are, besides pineapple and “exotic woods”? Just an aside, following the link to the Flexitral Perfume Notes, I read this page: (http://www.flexitral.com/products.html) which is interesting in reference to the banning of perfumes due to allergies (and the Ottawa public space debacle). Flexitral appears to be synthesizing a number of scents to replace bases like coumarin which are evidently classified as allergens in the EU. Interesting–I'll have to have a look at that and try not to get too hot under the color. Did you see that you can download a copy of Turin's Parfum: Le Guide, too? Oh yes, I d/l'd it immediately. I don't speak much French but there's someone here at work who is fluent and I'm going to get him to do me a translation. I've read some of it (translated) on Chandler Burr's site but there is only smattering. Colony: Fruit, Pinapple, Ylang Ylang, Iris, Oak Moss , Spices. Well, I'm looking forward to tomorrow's article and I hope to smell Cocktail (again?) one of these days. I don't know why I can't remember it now. Thank you for the lovely review of these sadly discontinued fragrances. Looking forward to your review of Vacances tomorrow – I'm determined to try this one somehow one day, being that I'm a lilac freak. Thus far, I haven't found any perfumes to satisfy me. Thanks! Definitely a chypre. I wonder what the “spices” are–I swear I smell marjoram, strange as that is. You're not one of the legions of En Passant fans? (I'm embarassed to say I haven't tried it yet, but it sounds great, and I like a lot of Olivia G's work.) It is sad to see so many great scents disappear. I wish they would reissue at least a few, like Guerlain is doing. Wow, I had no idea there were so many Portlanders in the perfume blogosphere! I get my fixes at the Perfume House too – it's my favorite store on Earth. I love Vacances more than I can say, and I recntly saw it for sale for $500 on an internet site – now that it's discontinued, as are the others, you have to really search for it and it has become a collector's item. (I did find it for less later, but still more than I ever paid for it. Sob!) Yes, it is just as ethereal a lilac scent as En Passant – with hyacinth to boot! Colony and Normandie are my other two Ma Collection favorites. I could just drown in Colony, and Normandie was the first truly woody fragrance that I really understood and appreciated, many years ago. Thank you for reviewing these wonderful fragrances. It is surprising how many of us are from Portland! Maybe The Perfume House has grown us from scratch. In any case, the last time I looked, they had Vacances, Normandie, and Colony in stock. I just found these notes for Colony and wanted to share. These notes are from The New Perfume Handbook by Nigel Groom. I adore this scent, there's nothing else like it, is there? Thank you for posting the notes! Still, no marjoram. I wonder if it's the ylang ylang plus pineapple that reminds me of it? Colony has been languishing in my cupboard. I'm getting it out again right now. On a Patou roll, thanks to you, Angela, and I just received my 2.5 splash bottle of Colony from a warehouse in Brooklyn with old stock. It is fresh as a daisy AND inside the box was a matching Caron print scarf with handrolled edges, 100% silk. Surprise, surprise! I thought the scarf only came with the parfum. Just letting everyone know in case they’re teetering on the edge of tracking down any of the Patous you so skillfully (and temptingly) describe. With any luck, you’ll get a gorgeous matching scarf, too!! Congratulations! Those little silk scarves are adorable, too.